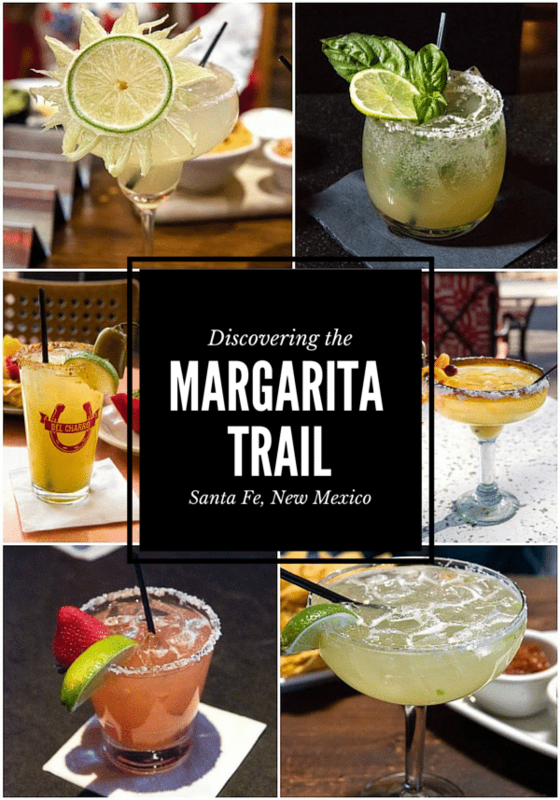 Discovering Santa Fe's 'Margarita Trail' & Best Margarita Recipes! 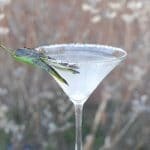 Margaritas and Santa Fe are a perfect pairing and visitors and locals can try the best margarita recipes Santa Fe has to offer with the Margarita Trail! 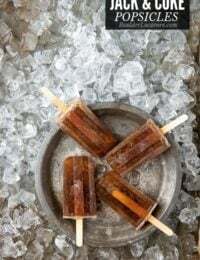 We sampled several and have the scoop (and best margarita recipes to share)! 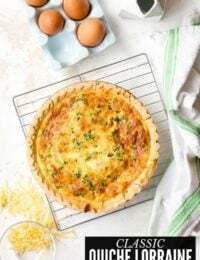 For any who have sought the enchanting experience that is Santa Fe, New Mexico, the food landscape has surely drawn your attention. Santa Fe is absolutely one of my personal favorite food towns, and one where I’d gladly make the six-hour drive for a good northern New Mexican meal. The smoldering, spicy, soul-warming cuisine has an obvious cocktail partner: the Margarita. They are almost inseparable, the food and the cocktail, especially while lazing on outdoor Santa Fe dining patios in the summer months, filled with desert serenity and the sense no schedule could be more important than the current delicious moment. Recently I dodged some large snow storms to make my way to Santa Fe to preview what I personally feel is no less than a stroke of pure genius: The Margarita Trail. 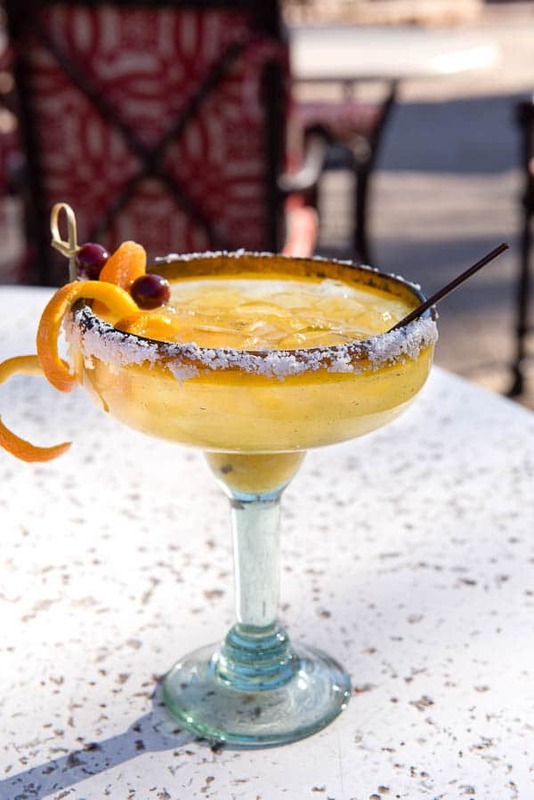 Kicking off on Cinco de Mayo (May 5th) this year, a number of Santa Fe restaurants and bars (thirty-one to be precise) will be offering up a signature margarita representing their establishment for patrons of the Margarita Trail to enjoy. Passports will be available for purchase for $3 at the three Tourism Centers, as well as the participating margarita venues, and will entitle the passport holder to purchase a margarita at any of the participating locations at a discounted rate. A stamp will be given in the passport for record keeping as patrons make their way selecting from venues of choice. Every type of establishment may be found on ‘the Trail’, from posh hotels to laid back bars locals love. There are prizes for accumulating stamps as well; five stamps gain a Margarita Trail commemorative t-shirt, twenty stamps a signed ‘The Great Margarita Book’, and completing all stops will reward with a home Margarita Bartender Kit. To keep the program enjoyable and safe, only two passport stamps will be issued in a given day. For those wondering ‘how different can one margarita be from another?’ I’m here to tell you, quite different. To date, without any overt planning, no two venues are serving the same margarita which speaks to the individual mixology voice of each participating location. I spent a few days hopping between a handful of the locations to sample and snap some photos to give you a taste! 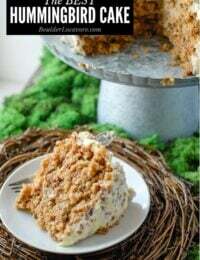 Some recipes have been included here (note links in margarita names) and the recipes for all the Margarita Trail margaritas will be included in the program passports. Built in the 1800’s, the original Staub mansion was constructed by wealthy merchant Abraham Staub for his bride, Julia. It was a center for society entertaining hosted by the elegant Julia. 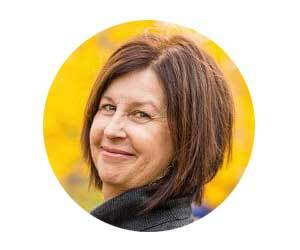 Included on the lovely grounds were apricot trees planted by Julia and her friend, Archbishop Lamy, who founded the nearby Santa Fe cathedral. An original apricot tree still stands today and produces fruit which is the inspiration for the Juliarita margarita. Homemade apricot-infused tequila (infused with the apricots from Julia’s tree), Cointreau, lime and a slice of apricot make up this sophisticated sipper which can be enjoyed outdoors on the patio or in the art-filled Staub House Bar. Incidentally it’s said that Julia has never left her beloved property. Evidence of her ghost have been observed over the years. I wonder what she’ll think of her namesake cocktail? My guess is that she’ll be very, very pleased. I was smitten with the charming thought behind this margarita as well as the luscious flavor and rich spirit of the cocktail (no pun intended). 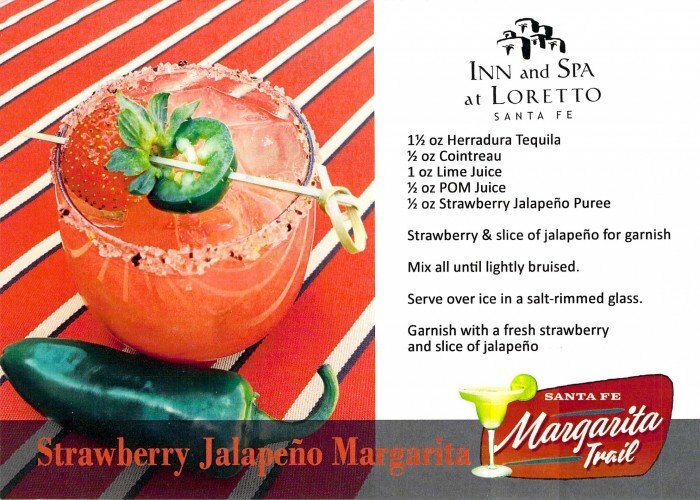 The highly photographed Inn at Loretto features a fresh Strawberry-Jalapeno Margarita. The fresh flavored spicy-sweet cocktail is a refreshing addition to the Margarita Trail. A walk around the property conjures the spirit of Santa Fe in the architecture and furnishings of The Living Room, their ample cozy lounge with a crackling fire, and comfortable leather furnishing. 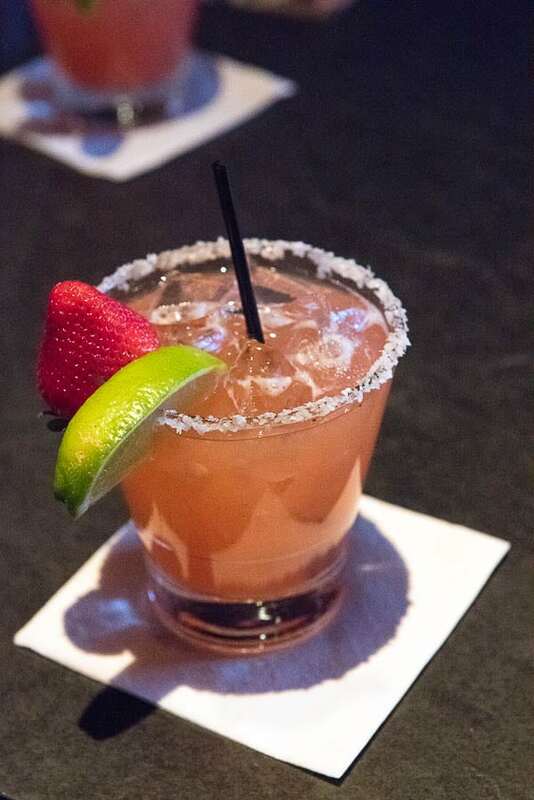 Click here to view/print the Strawberry-Jalapeno Margarita recipe. 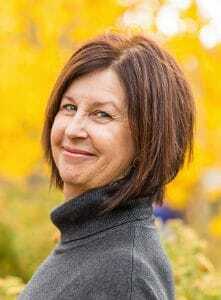 Recently opened Derailed, is an independently owned restaurant at the Sage Inn on bustling Cerrillos Road. They are serving a unique jalapeno-infused tequila margarita that includes St. Germaine liqueur. 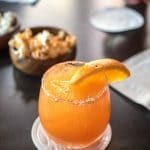 Perfectly spicy with a well-balanced flavor, the Tequila Mockingbird Margarita would be comfortably sipped in their bright comfortable lounge indoors or on the outdoor patio by the fire pits (they offer blankets too!). A signature of the restaurant is their use of essential oils in cooking rather than traditional herbs and spices. Definitely a cool venue to visit. 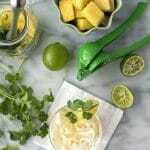 Click here to view/print the Tequila Mockingbird Margarita recipe. It was no surprise the Iguana Café and Cantina at the Buffalo Thunder Hilton 15 minutes north of Santa Fe would be a stop on the Margarita Trail. I visited them last year when they had just reopened the Iguana Café to feature a walk up Guacamole Bar where a sous chef will customize the guac to your preferences. 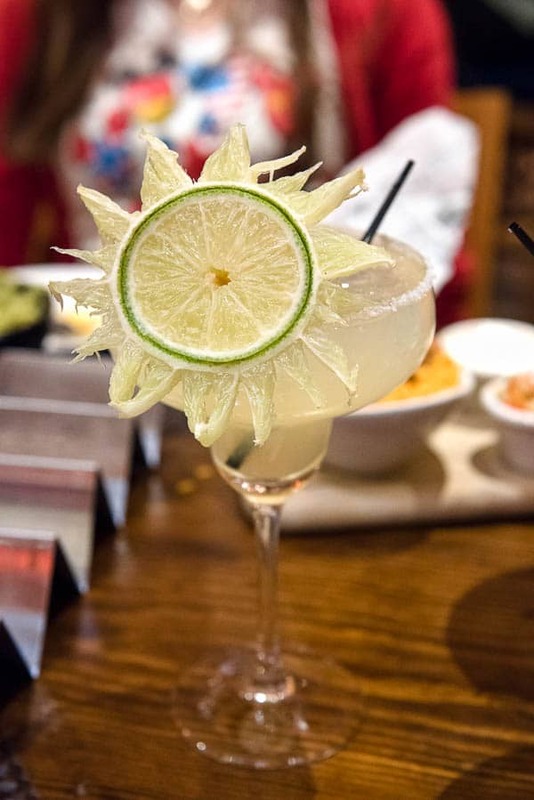 Additionally, they feature over 30 uniquely developed margaritas including the signature Buffalo Thunder Margarita which will be featured as part of the Margarita Trail. It is a great classic margarita served in an ample glass with my new favorite garnish (that gained rapt attention on Instagram too). It’s a very unique property featuring a warm welcome and elements from all the local pueblos. 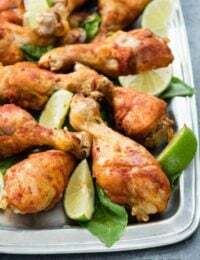 Click here to view/print Buffalo Thunder Margarita recipe or for details on the Buffalo Thunder Resort and their guacamole recipe. I’ll throw myself on the sword on this one. When this tasting was arranged I found myself figuratively scratching my head trying to put together the idea of a margarita and an Italian restaurant. What a fantastic surprise this was! Pranzo’s Basil White Peppercorn Margarita got my ‘most inspired’ vote for combining the Italian flavors we know so well with a margarita. 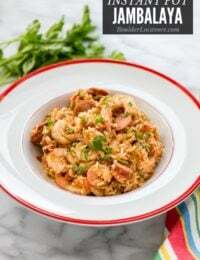 It has a wonderful blend of heady flavors I loved. And as though receiving divine concurrence, when I started to take some photos the light outside went black with only one shining ray falling on the cocktail. 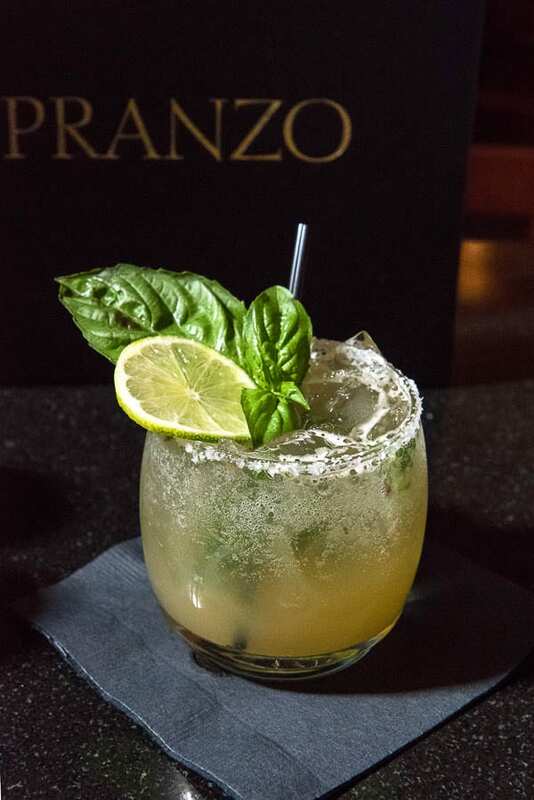 Anejo tequila finished in bourbon kegs, basil, grapefruit and more make this marg one you won’t want to miss. 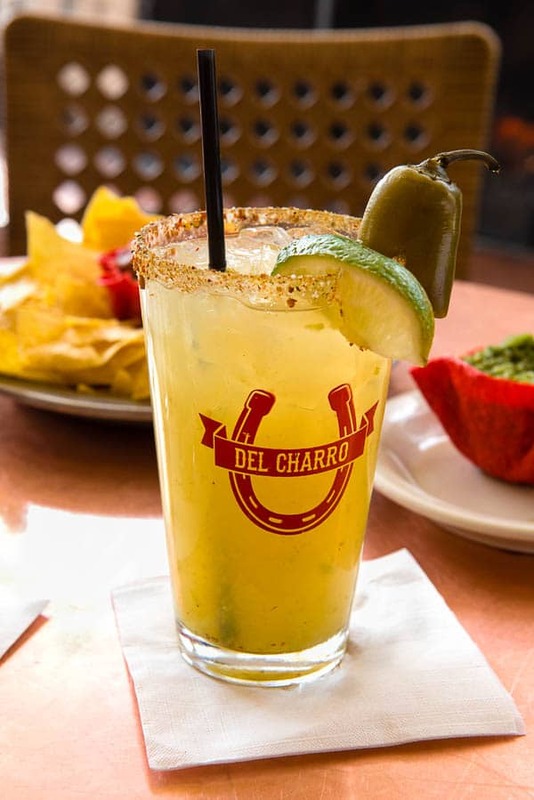 Uber popular award-winning Del Charro Saloon hit it out of the park with their green chile infused tequila Santa Fe Trail margarita. The thoughtfully developed cocktail is perfectly balanced between spicy and lightly sweet, with an attention-grabbing green chile powder, red chile flake and salt rimmed pint glass. A signature tequila-pickled jalapeno garnishes the margarita. 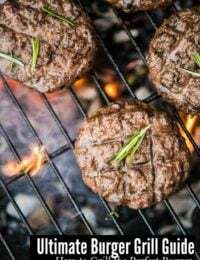 Del Charro Saloon is a few blocks from the Plaza with roaring fireplaces, a pop-up roof for their light, airy dining area as well as street side windows that fully open to enjoy summer breezes. Their burgers rock too. Just sayin’. 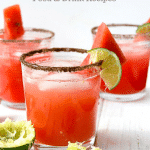 Click here to view/print the Santa Fe Trail Margarita recipe. 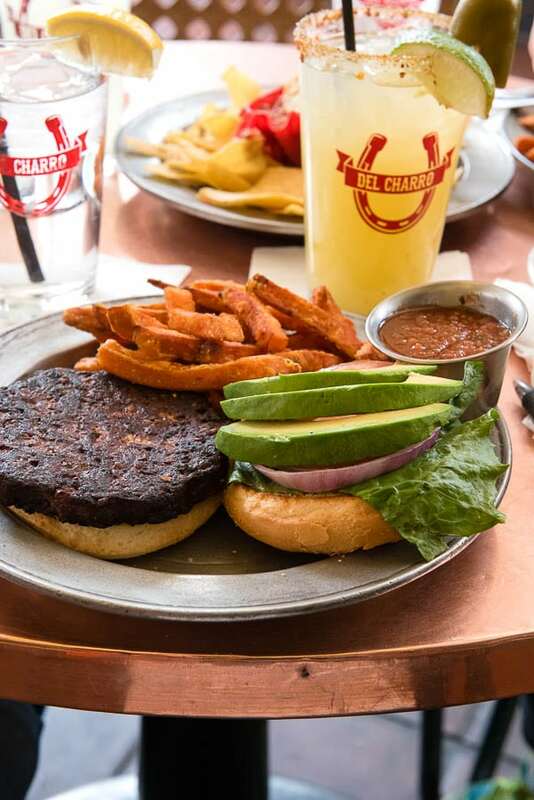 Del Charro Saloon’s Black Bean Veggie Burger with Sweet Potato Fries. 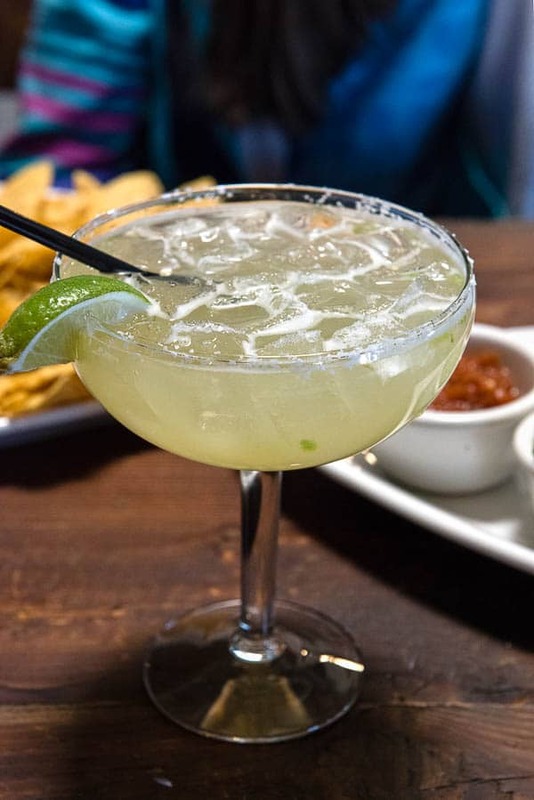 Click for full list of all participating Margarita Trail venues with a map and their signature margarita. I’ve actually never heard of a margarita with bourbon in it Tracy. Sounds like a riff on a margarita to me. If it’s good, that’s all that matters. You won’t find bourbon in any of the margaritas on Santa Fe’s Margarita Trail however. Those I sampled stuck to the traditional tequila, cointreau (or other orange liquor), lime, agave, etc.